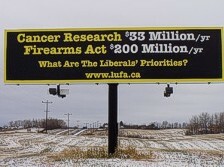 The current gun registration and fraud by the Liberal Government of Canada, that has already run up a $1 billion dollar liability without having anything good to show, will most likely cost Canadian tax payers hundreds of millions of dollars more before it will be scrapped. Let's hope it never comes into full operation, because then it will cost hundreds of millions of dollars per year to be operated, regardless of how inefficient and useless it threatens to be. However, not all is lost. If nothing else, the government's scheme to create work and have the citizens pay for it brilliantly illuminates a very important aspect of gun control. The increasingly stricter rules regarding gun control will in the end harm nobody but the average citizen. In a society in which law-abiding citizens are prevented from owning and carrying guns, the only people left in possession of guns will be criminals and the police, and the citizens will be defenceless. Those and more facts can be found in the stories at the links identified below, but don't expect that to change the gun-control advocates' thinking, ideology and rhetoric. The gun-control advocates got their minds firmly made up, no amount of truth will confuse them. Does allowing people to own or carry guns deter violent crime? Or does it cause more citizens to harm each other? Wherever people happen to fall along the ideological spectrum, their answers are all too often founded upon mere impressionistic and anecdotal evidence. In this direct challenge to conventional wisdom, legal scholar John Lott presents the most rigorously comprehensive data analysis ever done on crime. In this timely and provocative work he comes to a startling conclusion: more guns mean less crime. By John R. Lott Jr., the John M. Olin law and economics fellow at the University of Chicago School of Law and the author of "More Guns, Less Crime." The ballooning $1 billion price tag of the Canadian gun registry was predictable to anyone who has followed this massive boondoggle, says Gary Mauser, author of the study Misfire: Firearm Registration in Canada, published last year by The Fraser Institute. "It was clear to me in 1995 that this thing was a white elephant," says Mauser, a highly-regarded academic from Simon Fraser University. The federal government claimed in Parliament that it would cost no more than $85 million over 5 years to implement firearm registration. In 1995, Mauser predicted that the final cost for the registry would be between $1 billion and $1.5 billion. In 2002, the full cost of setting up the registration bureaucracy has already reached $1 billion. "We don't know how much this fiasco will eventually cost but if it is allowed to continue on the same path, the bill could easily reach $2 billion by 2005," he says. ....To the end of March this year, the registry had cost $688 million. By the end of the current fiscal year, it will have consumed another $185 million, for a total of $873 million. Even if it manages to stay on budget (something it has never even come close to doing in any given year), by the end of 2004, the registry will have devoured $1 billion. ....Progressive Conservative Leader Joe Clark insisted that Cauchon uncover who had authorized "the deliberate withholding of information from Parliament," and fire them.